Leaflet from March 2011, Burnt Bookmobile, concerning the U.S. Postal Service strike of 1970.
run by some people influenced by various anti-authoritarian tendencies, including insurrectionary anarchism, left communism, and nihilism, among others. 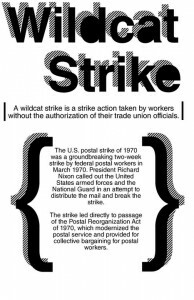 During the spring of 2011, when the ‘Wisconsin Uprising’ or ‘#wiunion movement’ was in full swing, they put out a number of flyers, leaflets and posters that pushed the occupation or general strike concept forward and contributed to the more militant atmosphere that Madison saw traces of. Earlier this week, in The Guardian, Slavoj Žižek asked, “Occupy Wall Street: What Is To Be Done… Next?” He points out the fallacy of attacking greed without attacking capitalism, and of protests that “express a spirit of revolt without revolution,” i.e., creating that which will fill the shell of the old world (to quote from the preamble to the IWW Constitution). This was written by Denver General Strike Committee. Posted on Friday, April 27, 2012, at 5:53 PM. Filed under Articles, Strikes & Occupations. Bookmark the permalink. Follow comments here with the RSS feed. Both comments and trackbacks are currently closed.